I can’t remember the last time I went out for a Sunday Roast. A glance at my posts tells me the last time I wrote about one was over a year ago. I was, of course, more than happy to rectify this. I had a few personal recommendations for the Ruddington Arms before it won Best Pub in the recent Nottingham Food And Drink Awards – I rang at about 9am Sunday morning and managed to get a table for 2 for 1500. Although we managed to get a table, that this was one of the only remaining gives you an idea of its popularity! The space is split in the usual pub way of a bar and casual seating area toward the front with a dining room at the back. The pale woods were bathed in natural light which made for an attractive look – though lots of pillars made it feel more pokey than it actually was. The Sunday lunch menu still had a signifant number of options outside with 6 starters as well as 3 sharing platters. I went for a pub classic with a Prawn Cocktail (£6.5), annoyingly, delivered in a Kilner Jar. It looked attractive enough but was fiddly to extract things from, especially near the end. There was no new take on the food itself though, decent prawns with a good marie rose sauce and crisp iceberg lettuce has been doing the job for years. There were a handful of cherry tomatoes too which were of higher quality than most you encounter in this sort of dish. My girlfriend had a rather more attractive looking smoked salmon dish. It was served with kohlrabi, a little dill and a few hazelnuts. Nice flavours, a little crème fraiche with lemon or horseradish would have bought it together in my opinion but it wasa generous portion of the fish so few complaints. Beef, chicken and pork were the main contenders for a proper Sunday Roast though fish and chips and a burger were also available. Beef (£13.5) was the only choice for us and 2 plates dominated by a beautiful pink piece of meat. It was a little fatty but the portion was so sufficient you didn’t feel short changed – and the taste was excellent. Trimmings were enjoyable too, Yorkshire crisp but forgiving under a barrage of flavourful gravy. There was an additional pot of gravy delivered immediately and without request which was a nice touch. Potatoes were crispy, to the extent it was a bit of a struggle to cut through (personally just how I like them!). Vegetables were less to my preference, cabbage still had a good bite to it but struggled to be very exciting. Swede and carrot mash needed to either be a puree or fairly chunky rather than the course paste it ended up being. Horseradish hollandaise was a nice touch to bring some refinement and it was well executed, just a bit rich for me with everything else going on. 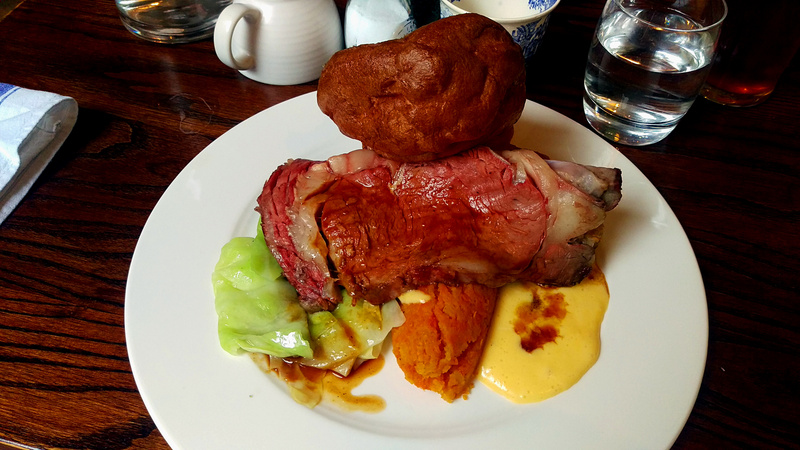 The main course at £13.50 puts it toward the top end of local Sunday lunches. Though the only competition as good as this that I’ve had is the Moleface Pubs (Larwood and Voce, Lord Nelson and The Wollaton). Their all around experience is better in my opinion (particularly at the Larwood) but their equivalent roast beef is a little pricier at £15. Service was perhaps overly efficient, you don’t want to be asked if you want a dessert moments after finishing a giant plate of food. It would take a lot more than that though to discourage me from returning for more of their roast beef.